Skateboarding is one of the greatest sports of all times, in regards that it is loved and pursued passionately by many. Just a simple online search will yield so many results about skateboard daredevilry and showmanship that they are bound to inspire a few people at the least. But even while going with trivial standards, one cannot refuse to acknowledge the craze surrounding the sport. So if you are one of them and have been looking for something to find a first footing in this sport, you are at the right place. This article will guide you effectively through the points that you should keep in mind while looking for a skateboards for beginners. The grip and the roll: A new rider is often uncomfortable while making those sharp and sudden turns. They are not as used to shifting their weight naturally as the seasoned ones. This calls for special measures that make their ride more flexible in comparison to hard boards. This is where the terms of grip and roll come in. In skateboards for beginners the wheels are so attached that at turns the wheels themselves sway a little to make for a natural change in weight distribution. This helps the rider in keeping his or her balance on the board. Such boards are more responsive to weight distribution in comparison to others. New riders are more comfortable. Ability to move around: When starting out, try to look for a board that helps you to take it along wherever you go. These boards are no longer than 27 inches, hence can be fit into your bag quite comfortably. So feel free to ride it anywhere that you want to, on the way to office or back home or in a park or in a stadium. Why keep yourself limited when you have the option to move around continuously. Made out of plastic they are light and hence can be maneuvered quite easily. All that you have to do is make sure you are not going downhill on it too fast as being made of lightweight material; it can break down and result in injury of the rider. 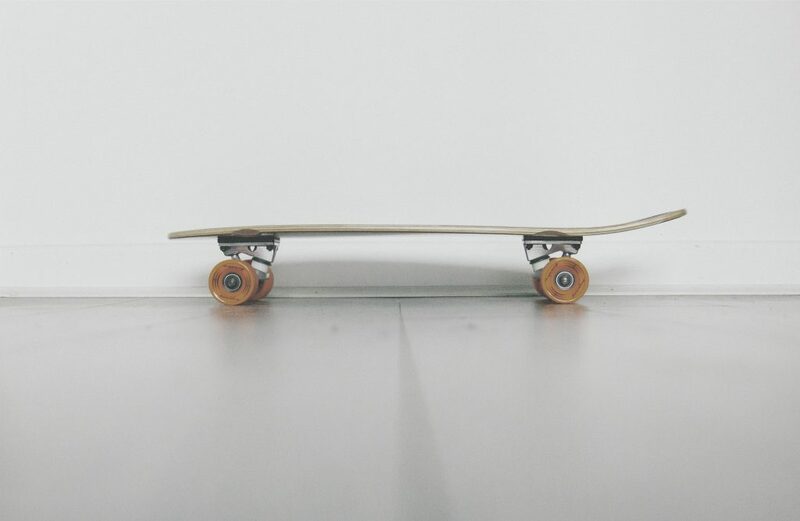 Do not go too low: When buying their skateboards when starting out, most people opt for the lowest priced options thinking that they can upgrade along the way as and when they get the chance to do so. This is actually quite ill advised. The options that you get at the lowest end often make for the bottom quality products. They might not be properly fitted or put together and can result in the rider sustaining a lot of injuries. But if you go for a little higher range, you might get quality boards that have been designed keeping in mind the requirements of beginners. These boards provide you with some of the features that let professionals ride so smoothly, like stability, excellent weight distribution ratio and professional grade components. Safety of the rider: However, while looking for the above mentioned qualities do not forget to look for the most important aspect of it all, safety. Many new riders try to emulate the riding styles of professionals and get injured. If you are unsure about your riding style then try going for a style that puts safety first. There are boards that are low set and have a lower center of gravity, making them more stable and less likely to topple over. The more confident you get with your ride, the better you can upgrade to. But till that time comes, try to stay with the one that lets you ride without any fear of falling off. It will not only boost your confidence but also make you more comfortable to try out new styles. If you have never ridden before and want to climb up the tricks quickly then this is the way for you to go. Size and shape: Most of the skateboards are 8 inch wide. But if you are someone who has got wide feet and want to be more comfortable then opt for a larger one that comes with all the supporting features that you want on your board. Also, try opting for a concave shaped board that lets you maintain the balance. As you develop in confidence switch over to a flat board or a long board which is flat in shape too. The most important thing is for you to ask yourself what are the features that you particularly need in a skateboard. After having your answer, try to address them in the best way possible. It will help you I not only learning quickly but also moving through the curve at a faster rate. So there you go, almost everything that you need to know when looking for a skateboards for beginners. Make sure that you are purchasing only from an authorized shopkeeper that sells out quality products. Investing money into the venture and not getting the product you were promised can be upsetting for anyone. Do not be in a hurry to learn a new craft; it often takes getting used to before you start to learn something. Take your time and know that everything can be achieved through patience and practice. What it takes is just the ability to stay committed to the program. If you are a newbie then you must have an inspiration that pushed you to go for this option, read more about him or her and continue to strive for excellence even in the face of failure.